You are here: Home › Buying guide › How do I tell if it’s a parallel import? Many Aprilia Futuras sold in the UK were parallel imports intended for another country. There may even still be a handful knocking around at dealers. It naturally follows that many used bikes offered for sale will also be parallels. Parallel imports were brought in by dealers (as opposed to UK bikes, which were imported by Aprilia UK and therefore UK spec) from the continent, and are therefore EU spec. UK spec bikes only differ very slightly from bikes intended for the rest of the EU. The main differences are the headlight and the speedo readout. Euro-spec bikes also have temperature readouts in Centigrade instead of Fahrenheit, and fuel readout in litres rather than gallons. It’s illegal to sell machines that are not UK spec, so they have to be converted, but some machines still had EU spec – i.e. right-dipping – headlights. These will fail an MOT, strictly speaking, although some testers will pass a bike with the right dipping part of the lens taped off and some will ignore it altogether. If you’re lucky enough to find a new Futura, assume it’s a parallel, and ask if it has a UK spec headlight. Some dealers claim the Futura has a flat beam headlight fitted, but this is b*llocks. 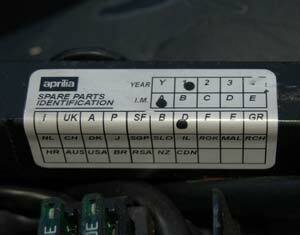 The Aprilia parts fiche for the Futura lists three different headlights, one for the UK, one for the rest of the EU and one for the USA. The headlight is meant to dip to the left, and you can check this by comparing your lens with the diagram on the right. Also, the bike has been out of production since 2003, so the tyres on any remaining new bikes are likely to have gone off. Tyres are designed to last five years only and you can tell the age of your tyres by looking for the four figure lozenge on the sidewall. The lozenge number corresponds to the week and year the tyre was manufactured, so for example if the lozenge says 5001 then the tyre was made in December 2001. How do I tell it’s a parallel? Sometimes it’s obvious. German bikes tend to be covered with warning stickers in German only, usually plastered all over the fuel tank. To tell for sure, lift the seat and look at the right frame rail for the batch sticker. You’ll see something like the image to the right, a 2001 batch 1 model intended for Germany. Later models have fewer countries on the sticker.